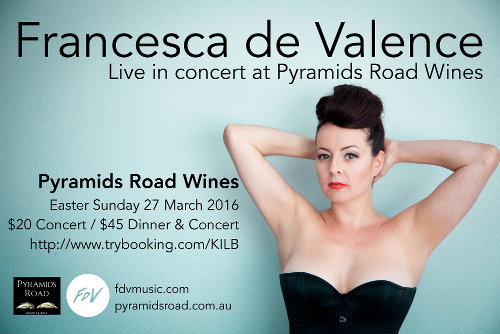 Spend your Easter Sunday evening with a dinner and show presented by Australian singer-songwriter Francesca de Valence and the award-winning winemakers of Pyramids Road Wines. This Easter Sunday show is a very popular annual event in the Granite Belt. Be quick to book tickets to avoid disappointment. Accommodation should be booked ASAP. Easter is a busy time of year around the Granite Belt region. If there is enough demand for transport from Stanthorpe or Ballandean, we can organise a bus for an additional fee. Please contact Sue at Pyramids Road Wines before March 15 if you wish to book transport.